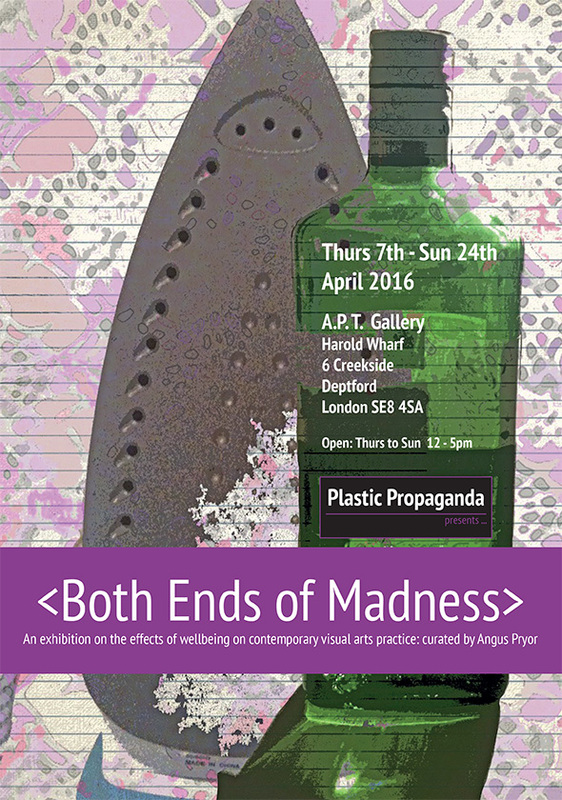 This exhibition is looking at the effects of Wellbeing on contemporary visual arts practice. – Tony Gammidge – Artist, film maker, art therapist, lecturer and Arts and Health worker. Throughout the History of Art, madness has been a recurring subject matter. This exhibition intends to explore both ends of madness, whether it is the artist who makes work that is indeed a struggle to achieve because the search for the impossible artefact is being explored, or it is about how art can be used as a therapy and explanation of why circumstances have happened, for example, how a nervous breakdown or an addiction can lead to a fulfilling art work. The link between madness and creative genius has been made in many studies, including “Are Genius and Madness related? Contemporary Answers to an Ancient question”. Dr Dean Keith Simonton. Ever since antiquity, thinkers have associated creativity with psychopathology—the classic idea of the “mad genius”. The common conclusions, based on historiometric, psychiatric, and psychometric research are that (a) exceptional creativity is often linked with certain symptoms of psychopathology and (b) this linkage has some degree of genetic foundation. Nevertheless, this relationship is not equivalent to the claim that creative individuals necessarily suffer from psychopathology. A theoretical interpretation is offered in terms of the cluster of cognitive abilities and dispositional traits required for creative behaviour and the impact of genetic and environmental factors in the emergence of this cluster. At this end of Madness, the exhibition will ask questions on how the creative process is not necessarily a pleasurable experience but often a struggle with learned ideas about creating an engaging artefact full of questioning intent. Examples of this are Pollock, Rothko, Goya, Munch and Gericault, and how the artist is often aware of his or her own madness and uses it to create a meaningful legacy. The exhibition will question the use of subject matter as a means to make art. Often these are painful experiences that lead to “making art about what you know about”. This concept leads to the other end of Madness. Often the human condition can play weird tricks on us and these are frequently exposed in art-making. Examples of artists who bridge this gap are Bobby Baker, Tracy Emin, Richard Billingham, Michael Landy, late De Kooning, Kusama, Bill Viola, and Mike Kelley. Individuals suffering from mental disorders may attend day hospitals, In-patient units and other institutions. Generally these provide a safe environment to encourage self-expression through (usually) painting and drawing. The process of making art in such an environment may enable the ‘patient’ to connect with their emotional, psychological, social (life experience) and, for some, their spiritual self. Often the Arts can help breakdown or burnout: At the outset, the act of making is one of catharsis but the individual may not appreciate it at the time. Suffering from a severe mental burnout, the individual can be broken, made devoid of cognitive skills. Time, therapy and education help to rebuild the mind and spirit leading to greater happiness and a better sense of purpose. The clarity of the proposal is around control, hence both ends of madness being the loss of control and the observation of this loss, the artist is the vehicle of both the ends, who is mad and who is the observer? Through this exhibition and symposium, Plastic Propaganda wants to explore this legacy and the therapeutic benefits of art making. We have many artists (including Anjula Crocker, William Henry, Mike Walker, Jez Giddings, Mark Howland, John Butterworth, Mandakini Devi) who all deal with these issues on a daily basis and use this subject matter to communicate a potent message that, with viewer interaction, will help demystify the stigma and create individual works of quality and an intriguing exhibition and debate.